Nearly fifty years on from the Stonewall Riots that helped kick-start the Gay Liberation Movement, this February marks LGBT History Month. The theme for 2019 is Peace, Activism and Reconciliation. 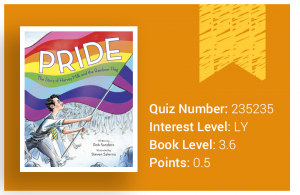 To celebrate, we’ve picked out some great fiction and non-fiction books for all interest levels that are sure to get kids exploring LGBT history and issues. All of these have AR quizzes. You can find more by using the LGBT+ issues topic on the AR Bookfinder advanced search. Frockodile by Jeanne Willis is a hilarious and heart-warming book that will teach lower-years readers about the values of acceptance. With brilliant illustrations, it also demonstrates how important it is for people to be and feel like their true selves. A great way to introduce younger children to LGBT history is through Pride: The Story of Harvey Milk and the Rainbow Flag. Rob Sanders’ simple and powerful non-fiction text explores the origin and development of the iconic rainbow flag. The story is accompanied by wonderful, full-page illustrations. George from genderqueer author Alex Gino follows transgender fourth-grader Melissa, who everyone else calls George. The winner of a Stonewall Book Award, George sheds light on an experience that is still often misunderstood and stigmatised. It’s well worth recommending to middle-years students. From Prejudice to Pride: A History of the LGBTQ+ Movement provides perfect reading for LGBT History Month. Here Amy Lamé takes a look at LGBT history, going as far back as the ancient world! Wonderful for those keen to learn about the rise and achievements of the LGBTQ+ movement and the different communities, pioneers and stories of heartbreak and courage that have marched alongside it. Patrick Ness’s Release is an outstanding young adult novel. The coming-of-age story of Adam, a gay teen and son of an evangelic preacher, is paralleled by that of the ghost of a murdered girl. Shortlisted for the 2018 Carnegie Medal, Release is a beautifully written and enthralling work of fiction. Our non-fiction pick for upper years is Trans Global. This book enables readers to uncover the cultures and people of the past and present who have embraced, challenged or quietly subverted society’s expectations about gender. Honor Head’s fascinating inquiry into transgender history will engage and enlighten older readers. Quiz coming this week! If you have any books to recommend, or are celebrating LGBT History Month at your school, we’d love to hear about it via our Facebook or Twitter! If you’d like to learn more about this year’s LGBT History Month, please visit the official website. WKAR Quiz Writers’ Choice Award nominees for 2019!